When the dog becomes the mailman. What does an autonomous delivery bot do when it encounters a set of stairs in its path? Automotive corporation Continental teamed up with startup ANYbotics to combine the mobility of a four-legged, Boston Dynamics-style robot dog with an autonomous delivery vehicle. The result, which it showed off in a live demo at the Consumer Electronics Show in Las Vegas this week, comes across either as a “Black Mirror” episode — or a vision of the future of delivery. 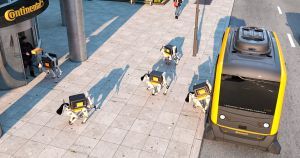 The concept is an unusual one: an autonomous vehicle pulls up to an address and spits out one or more (the press release isn’t entirely clear) smaller quadripedal robot dogs, which ANYbotics calls “ANYmals,” to complete the delivery. During a live demo, the robot dogs climbed stairs and even rang a doorbell. This tech is probably still many years out. We haven’t even figured out if we’re willing to share public sidewalks with tiny wheeled delivery vehicles yet. One such delivery vehicle even burst into flames in California last month. Companies like Boston Dynamics have made major strides in four-legged robots that can complete a range of tasks, from climbing steep hills, to mapping complex environments. If those types of advancements can be used to drop off meals or parcels, it could revolutionize the delivery industry.